The Cotswold Olimpicks; spelled here the old fashioned way, were founded four hundred years ago in 1612 by a country lawyer named Robert Dover. He wanted to revive the ancient Greek games for fun and enjoyment for all. The original Cotswold games included dancing, shin kicking, wrestling, backswords, spurning the bar and throwing the sledge hammer. The Cotswold Olimpicks were supported by King James 1st after a while the annual event became celebrated in a book of poetry “Annalia Dubrensia” published in 1636. It is from this event that the modern Olympics were born. When London hosts the 2012 Olympics the nation will also be celebrating its own 400 year anniversary of the first Olimpick games held in Britain. Following with tradition, the Cotswold Olympicks are held each year on the Friday following Spring Bank Holiday. 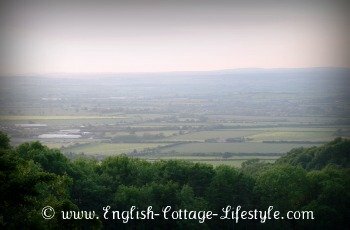 On Dover’s Hill above Chipping Campden, Cotswolds, Gloucestershire. You can easily get to the Cotswold Olimpick Games by bus from the beautiful village of Chipping Campden in the Cotswolds, Gloucestershire. The bus will also bring you back from Dover’s Hill if you catch it early, or enjoy the late evening fireworks and return walking back with the torch light procession into Chipping Campden. If your still full of energy you can dance the night away in the village square. The locals in Chipping Campden are very friendly just ask them for any help or information. The lovely lady in the high street book shop bought me up to speed in about ten minutes! While you are in the book shop look out for the book “English Olimpick Games” by Celia Haddon. This is where I bought my copy...Update...the book shop is not there anymore, you can find the book online. It’s a great book for history lovers and it’s short enough to read in a day, so you will have a good understanding of what’s going on before the first shin is kicked. 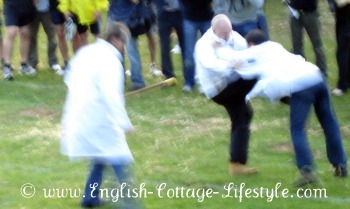 Shin Kicking and English Country Sports. Today the Cotswold Olimpicks are host to many traditional English country sports. The program has included in the past a rural obstacle race, a five mile run, throwing the hammer, spurning the barre (similar to tossing the caber), putting the shot, standing jump, tug o’ war and shin kicking. Shin kicking is a form of English martial arts and wrestling, shin kicking was very popular in the Cotswolds, Cornwall, Devon and the Lake District. At the Cotswold Olimpicks the game was about out-playing each other, instead of the Cornish or Cumberland ‘hug’ the contestants would hold each other at the shoulder and began kicking the shins to weaken the opponent to the ground. 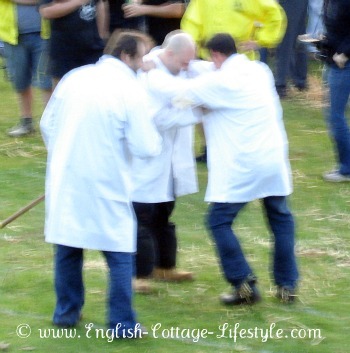 The contestants wear a white smock which is traditionally warn by shepherds and are allowed to protect their shins with straw. The umpire or judge is called a ‘stickler’ because he carried a long stick to part fights safely. It is where we get the expression a ‘stickler for the rules’. The shin kicking contest is open to all those brave enough to enter. If all this sounds a little barbaric, fear not, there is plenty more to do. You can get your face painted, watch bird’s of prey and Morris Men, see a collection of classic cars or watch people contorting their faces by Gurning. The program may change slightly each year but it will always be entertaining. 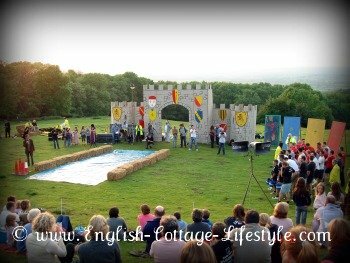 It’s all good fun, I highly recommend the Cotswold Olimpicks. The village of Chipping Campden is beautiful and is a must see for any English cottage lover and when combined with a fun, rural and historical event like the Cotswold Olimpicks there is no better time to go. I can only imagine how much fun the 2012 Olimpicks will be! Mark your calendar.